CLEAN YOUR FLAT TOP GRILL LIKE A PROFESSIONAL with a grill stone cleaning block! 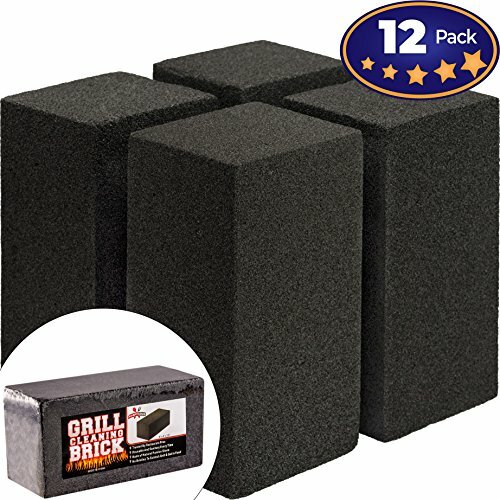 Grab a multipack of the grill bricks commercial kitchens use for a quick, non-toxic flat surface grill cleaner. The pumice stone surface provides a soft abrasive that won't leave behind metal splinters like wire brushes or steel wool. Why use pumice stones for cleaning instead of a wire brush, steel wool or other grill cleaning supplies? We're glad you asked! Our grill cleaning stones are made from naturally non-toxic pumice and do not contain any harmful or flammable chemicals, so they're safe to use on hot grill surfaces. The grill cleaning stone also won't leave behind any metal splinters or bristles that could harm your guests. Even if some black stone dust gets into food, you can rest assured that it's non-toxic! I've never used a grill brick cleaner - how does it work? Pour a little warm water or club soda on the grill, apply the flat surface of the cleaning brick to the grill with light pressure to remove residue, and rinse the surface with a little water before cooking to rinse off any blackstone dust that may be present. The grill brick smells weird on a hot grill, are you sure it's safe? The natural pumice used in our grill cleaning stone is made from volcanic rock, so a slight sulfur-like smell is totally normal and safe. If you aren't completely satisfied with your order, simply reach out to us through the Amazon messaging service and we will respond within 24 hours to make it right even on the weekends. We absolutely guarantee your satisfaction or your money back! SAVE ON TIME & SHIPPING WITH A BULK PACK. If you use your griddle often, you might as well stock up with more than one grill cleaner brick so you always have one handy. NO BRISTLES TO SCRATCH SURFACES & GET IN FOOD. That wire brush can scratch your griddle and leave behind bristles that get in your food. Avoid that hassle with our grill stone cleaning block! LIFETIME MONEY BACK GUARANTEE! We stand behind all of our products. If you're not 100% COMPLETELY SATISFIED, just send us an email, and we promise to make it right! TRUSTED BY RESTAURANT PROS. Cooks need a great flat top cleaner that doesn't require a lot of elbow grease and that can be used on a hot grill. That's why they use a grill brick-and so should you! If you have any questions about this product by Avant Grub, contact us by completing and submitting the form below. If you are looking for a specif part number, please include it with your message.